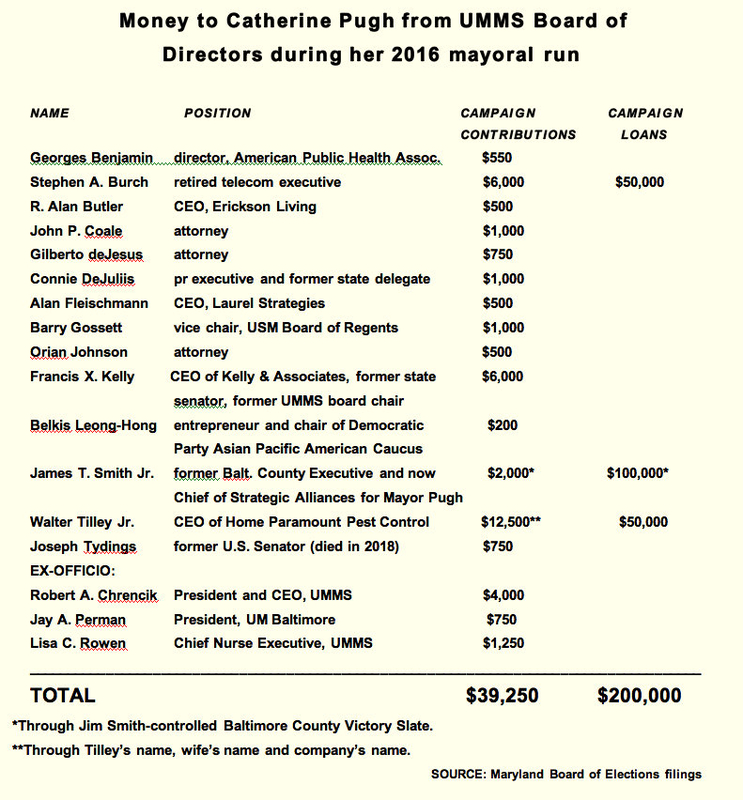 The disclosure that the University of Maryland Medical System paid $500,000 to Baltimore Mayor Catherine Pugh – who sat on its board for 18 years until her resignation this morning (see below) – shouldn’t come as a total surprise. In explaining its payments to the mayor, UMMS said the money helped her print and distribute 100,000 copies of her self-published “Healthy Holly” books to Baltimore schoolchildren. This was not a one-off. Pugh’s financial and political ties with UMMS go much deeper than the book payments. 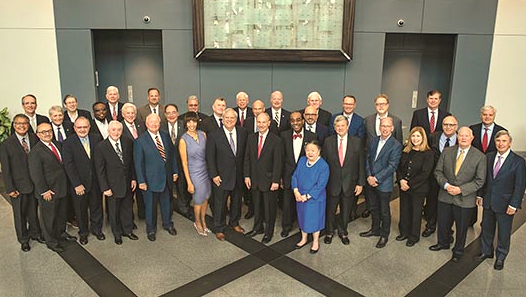 During the 2016 election, high-level representatives of UMMS – a private corporation that operates the University of Maryland Medical Center and Midtown campus in Baltimore – went to considerable lengths to pave the way for Pugh’s success as a mayoral candidate. Most notably, three directors of UMMS lent Pugh $200,000 just days before the April 26, 2016 Democratic primary. The cash influx allowed her campaign to offer free meals, transportation to early polling sites and money – what opponents decried as “walk-around” money – to precinct workers who brought voters to the polls. The loans – once they were revealed in campaign disclosure documents – were credited by many as getting Pugh over the finish line, clutching a narrow victory over former Mayor Sheila Dixon. Mayor Pugh issued this statement on Monday morning, March 18. To get a better sense of the ties binding UMMS to Pugh, we have re-reviewed the financial disclosure records posted by the Maryland Board of Elections. For starters, we traced $68,150 in cash donations to Pugh by administrators and directors associated with UMMS during the campaign. That was many times more money than offered to all mayoral candidates by representatives of the Johns Hopkins Medical System and MedStar Health, the city’s two other large hospital organizations. Slightly under $40,000 of these contributions were made by 17 members of the UMMS board of directors. Pugh was appointed to the board in 2001 for a five-year term by then-Governor Parris N. Glendening. Before today’s resignation, she was approaching her 19th year as a UMMS director. When she first took her seat, Pugh was a backbench city councilwoman teeming with ambition. In 2005, she got appointed to a vacancy in the House of Delegates, and, by 2007, she was the state Senator from the 40th District. It wasn’t long before she was in a position to review and approve millions of dollars in state aid to UMMS-affiliated hospitals as chair of the health subcommittee of the Senate Finance Committee. Back in 2011, she lost badly to incumbent mayor Stephanie Rawlings-Blake. 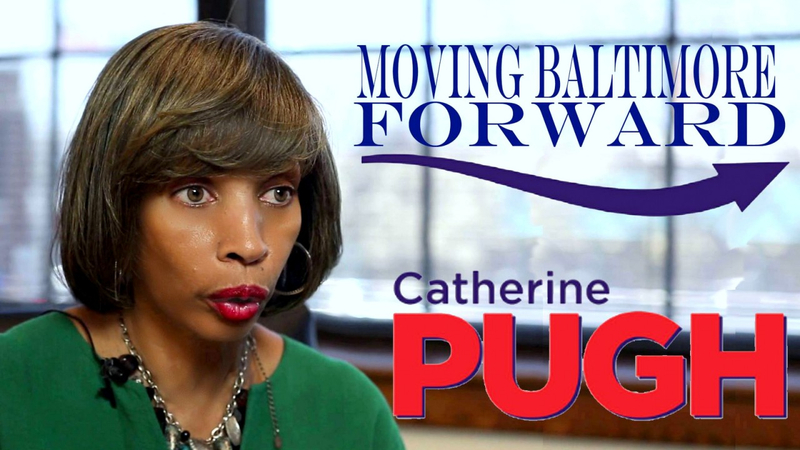 When Rawlings-Blake announced that she would not run for re-election in September 2015, Pugh was ready. And her friends at UMMS were ready, too. Veteran UMMS director Francis X. Kelly – who helped privatize University Hospital and form UMMS as a Baltimore County state senator in 1984 – held a fundraiser for Pugh at his Hunt Valley insurance offices in October 2015. In this case, there were “people from University of Maryland, people from insurance companies, and just people who support me generally,” she told us. Kelly and his wife, Janet, chipped in $6,000, the maximum individual allowable in a four-year election cycle. UMMS board chairman Stephen Burch added another $5,000. Other UMMS contributors included the system’s executive vice president Henry Franey ($1,000), senior vice president Stephen T. Bartlett ($1,000), chief strategy officer Alison G. Brown ($1,000), senior development officer Janice Eisele ($1,000), general counsel Megan Arthur ($1,000), and vice president of external affairs Mark L. Wasserman ($1,000). By the end of the 2016 election cycle, UMMS president and CEO Robert A. Chrencik had given $4,000 to his high-flying director. 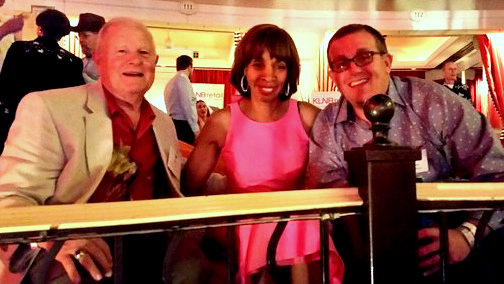 The fundraiser helped solidify Pugh’s early position as a top-tier candidate. But as the Democratic Party primary approached (the only election that counts in one-party-rule Baltimore), Pugh was unable to break out as the clear front runner. She faced Dixon’s cadre of volunteers and Paterakis-enhanced campaign coffers, a one-two punch that could thwart her best hope to win City Hall. In stepped UMMS chairman Burch – who accepted her resignation from the board today – and two “juniors” with lengthy political pedigrees – Walter A. Tilley Jr. and James T. Smith Jr.
Tilley was the scion of Baltimore’s “Honorary Rat Catcher,” an accolade given to his father by Baltimore Mayor Thomas D’Alesandro. The younger Tilley had expanded the family pest control business while cultivating connections to enlarge his Harford County political base. Smith, a former judge, transportation secretary and two-term Baltimore County executive, was appointed to the board by Governor Martin O’Malley in 2011. Burch and Tilley dug into their pockets and loaned Pugh’s campaign $50,000 apiece, while Smith added $100,000 more. Burch and Tilley dug into their pockets and loaned Pugh’s campaign $50,000 apiece sometime around mid-April 2016 (campaign records are vague on the exact date). Pugh won the primary. A month later, she took a victory lap at the International Council of Shopping Centers convention in Las Vegas – flying back and forth not on Southwest, but on the private jet of Walter Tilley. Jim Smith met her at the Maryland Party, the gala event staged at the Wynn Las Vegas by Howard L. Perlow, a convicted embezzler who was pardoned by Glendening in 2002. The Smith loan to Pugh was revealed by The Brew in June 2016, months before a state-required finance report would confirm the transaction. The Pugh campaign repaid the above loans in full, with interest, following a pre-general election fundraiser at the Baltimore Convention Center that netted over $600,000. After becoming mayor, Pugh named Jim Smith her “chief of strategic alliances,” a new position at City Hall. Last year, Smith collected $180,421.25 in salary, making him one of the best paid employees in Baltimore government. Meanwhile, Walter Tilley Jr. followed in his father’s footsteps, named the new “Honorary Rat Catcher” by the incoming mayor. As Pugh took up residence at City Hall, she was also picking up checks from UMMS that paid for the printing of her self-published “Healthy Holly” books. Last week we learned that, while Baltimore’s mayor in 2017 and 2018, she received $200,000 from the hospital system to print a fresh run of 40,000 copies of her books. How this all worked – from the payments issued by UMMS to the mayor’s Healthy Holly LLC to the location of apparently thousands of paperback books not available on Amazon and not currently being distributed by Baltimore City Schools – remains a mystery. We have asked UMMS for the contract between the institution and the mayor, invoices of the payments for the books, and copies of checks issued to Pugh or her LLC. Our request to the mayor’s office to review any signed contracts and MOUs between Pugh/Healthy Holly LLC and UMMS – as well as information about the printing, sale and distribution of the books – has gone unanswered.